Last week both the San Francisco 49ers and the Detroit Lions showed just how good they are this season on both sides of the football as they were able to defy the odds and continue to win football games. With the 49ers absolutely dominating the Tampa Bay Buccaneers (48-3), new head coach Jim Harbaugh may have found a way to turn this struggling NFL franchise around with some hardnosed defense and a surprising potent offense. There is no question that the San Francisco 49ers have had a talented football team for quite some time with the defense being their best asset, but before Jim Harbaugh came to town this team really struggled putting points on the board. With offensive weapons like tight end Vernon Davis, running back Frank Gore and wide receiver Michael Crabtree, there should be no excuse for the 49ers, but their problems seemed to be under center as quarterback Alex Smith continued to struggle on the NFL level. Now that Jim Harbaugh has seemingly gotten this talented team back on track, the sky is the limit for the up-and-coming San Francisco 49ers as it looks like this season will be the year they finally get back into the playoffs and reclaim the NFC West division title. In Week 6, the San Francisco 49ers will face arguably their toughest test of the season by going head-to-head against the undefeated Detroit Lions (5-0). 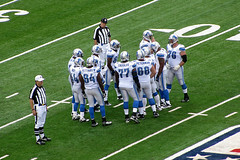 With five straight wins over very good football teams to start the season, the Detroit Lions have been able to live up to all the hype they were given in the off-season and throughout the preseason. With Matthew Stafford (1,436, 13 TDs, 4 INTs) and Calvin Johnson (451 yards, 9 TDs) becoming arguably one of the best quarterback/wide receiver duos in the league, the Lions offense has been near unstoppable by putting up 24+ points every week. Not only are the Lions one of the most offensively dominant teams in the league this season, but they are doing it at a record-setting pace with Calvin Johnson on the verge of shattering single-season receiving records. Along with the potent offense in Detroit, the Lions have also been a tough team on the defensive side of the football with Ndamukong Suh and rookie Nick Fairly leading the way. In the first five games, the Lions’ defense has been impressive with one of the best pass rushes in the game, but they will have to keep that dominance up on that side of the football this week with the key to victory in Week 6 being pressure on quarterback Alex Smith. If the Detroit Lions can keep Alex Smith running for his life in Week 6 the way they did with the Chicago Bears’ Jay Cutler last week, Matthew Stafford and company will be on their way to their sixth straight win of the season. As of right now, the Detroit Lions are favored to get the win with a -5 point spread and that sounds right to me! Take the Lions at -5.